PS I Love You released their third album For Those Who Stay last week, and now the band has released a video for “Friends Forever.” It’s a pretty amusing video, and I’ll let you see why for yourself below. The group will be on tour throughout this month, with a stop in Washington D.C. set for August 25th at DC9. 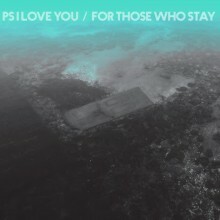 Kingston, Ontario’s PS I Love You released their third studio album For Those Who Stay this week via Paper Bag Records. Check out the muscle-bound new video for “Friends Forever” here. A full list of tour dates can be found below. Buy For Those Who Stay here from the Paper Bag Records Shop. For Those Who Stay is PS I Love You’s third album, and it was made after Paul quit Kingston for a different big smoke. It was encouraged by the girding strength of love but of course it’s still dredging and confused, of course it’s still resplendent in its churn. Of course the band had to go back to Kingston to record it – working at a place called the Bathhouse, the duo’s first time in “a proper studio”.